Born on April 29, 1899, Duke Ellington was raised by two talented, musical parents in a middle-class neighborhood of Washington D.C. At the age of seven, he began studying piano and earned the nickname "Duke" for his gentlemanly ways. Inspired by his job as a soda jerk, he wrote his first composition, "Soda Fountain Rag," at the age of 15. Despite being awarded an art scholarship to the Pratt Institute in Brooklyn, New York, Ellington followed his passion for ragtime and began to play professionally at age 17. In the 1920s, Ellington performed in Broadway nightclubs as the bandleader of a sextet, a group which in time grew to a 10-piece ensemble. Ellington sought out musicians with unique playing styles, such as Bubber Miley, who used a plunger to make the "wa-wa" sound, and Joe Nanton, who gave the world his trombone "growl." At various times, his ensemble included the trumpeter Cootie Williams, cornetist Rex Stewart and alto saxophonist Johnny Hodges. Ellington made hundreds of recordings with his bands, appeared in films and on radio, and toured Europe on two occasions in the 1930s. Ellington's fame rose to the rafters in the 1940s when he composed several masterworks, including "Concerto for Cootie," "Cotton Tail" and "Ko-Ko." Some of his most popular songs included "It Don't Mean a Thing if It Ain't Got That Swing," "Sophisticated Lady," "Prelude to a Kiss," "Solitude," and "Satin Doll." A number of his hits were sung by the impressive Ivie Anderson, a favorite female vocalist of Duke's band. Perhaps Ellington's most famous jazz tune was "Take the A Train," which was composed by Billy Strayhorn and recorded for commercial purposes on February 15, 1941. "Take the A Train," the "A" referring to a subway line in New York City, took the place of Ellington's previous signature tune "Sepia Panorama." It was Ellington's sense of musical drama that made him stand out. His blend of melodies, rhythms and subtle sonic movements gave audiences a new experience—complex yet accessible jazz that made the heart swing. Ellington's autobiography, Music Is My Mistress, was published in 1973. Ellington earned 12 Grammy awards from 1959 to 2000, nine while he was alive. 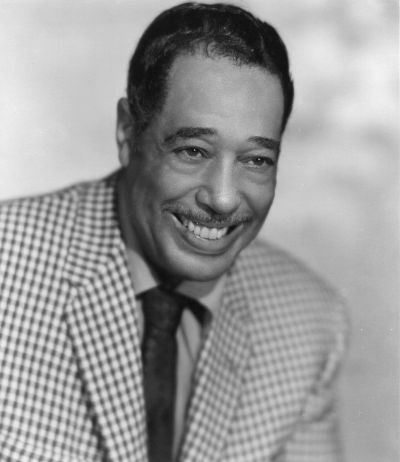 May, 1974, at the age of 75, Duke Ellington died of lung cancer and pneumonia. His last words were, "Music is how I live, why I live and how I will be remembered." More than 12,000 people attended his funeral. He was buried in Woodlawn Cemetery in the Bronx, New York City.